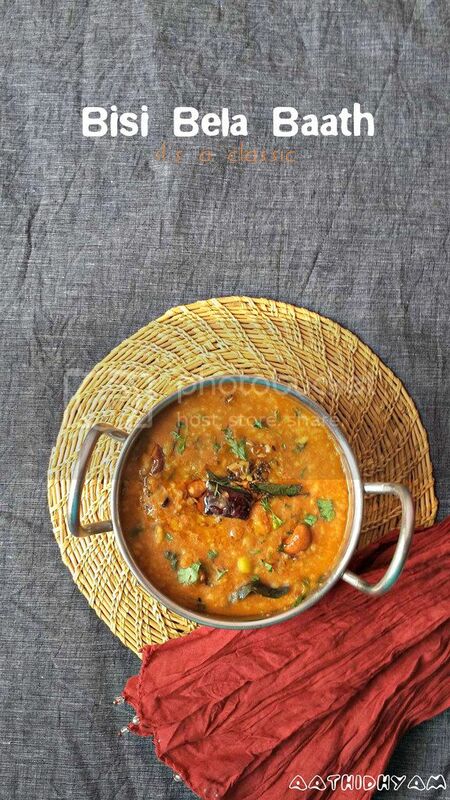 Learn how to make Bisi Bela Bhaat - Kannadiga style. Bisi Bela Bhaat has always been my infrequent love. Yeah, you read it right. Like I forget about its existence for some time and then all of a sudden I'd read about this on some random blog/website and then I am all gaga over it. For next few weeks, this makes it to my every week's menu and then all of a sudden I forget about it and then the same story repeats. I have fond memories associated with Bisi Bela Bhaat, I was like 10 years or so, I remember this conversation between dad and mom. 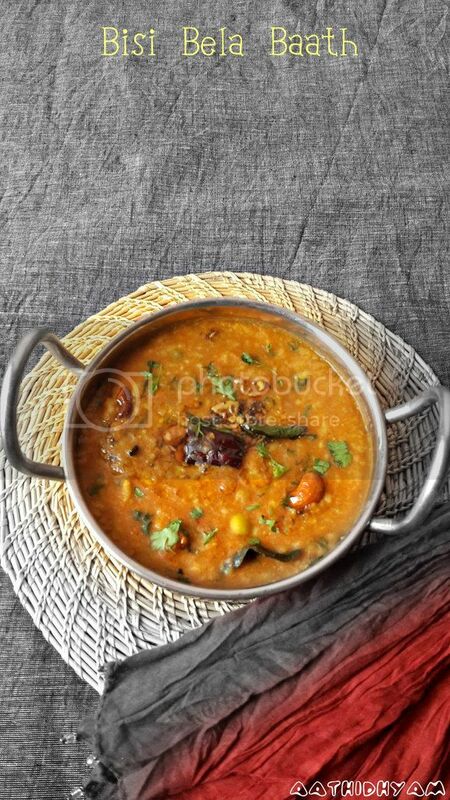 He came from his Bangalore trip and then he told my mom that he had something sambar rice type with vegetables and then it was served in a pot and all. He started describing its taste but couldn't remember the name. He called his B'lore friend and asked - Can you believe he actually described the entire dish to his colleague and then he told him that it was Bisi Bela Baath or Bhaat. My dad quickly scribbled its ingredients and gave it to my mom. When my mom prepared it, I liked it but then it was more like Dal - Chawal, so I didn't understand why my dad was so gaga over it. 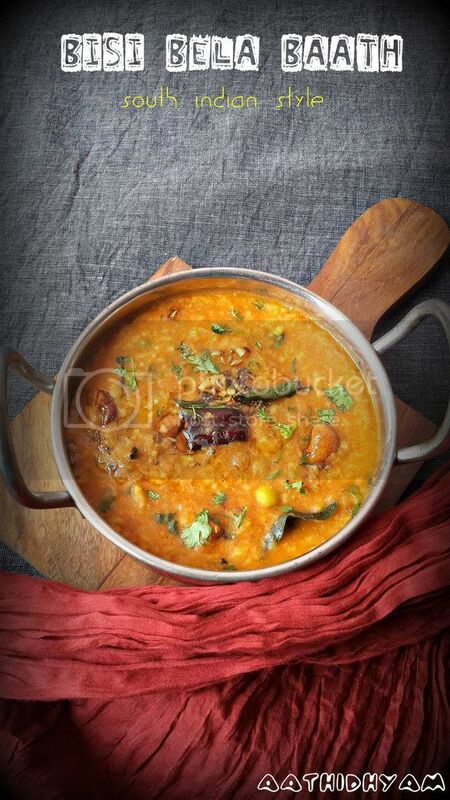 Because Dal makes it to our everyday menu and it tasted the same. 1) Wash and pressure cook rice, pigeon peas, for 4-5 whistles. Also, add salt and turmeric powder. Make sure you add enough water. 2) Once pressure releases, mash this rice + dal mixture. 3) To make life easy, you can even pressure cook vegetables in a separate bowl. 4) Grind the ingredients mentioned under for grinding list with water - 3 tbsps approx. 5) Heat a tbsp of oil and add the ground mixture. Fry until the raw smell subsides and add 1/2 cup of water. Make sure this is lump free. 6) Now add this mixture to rice and combine all the ingredients well. Add vegetables as well. 7) Taste and adjust salt if required. 8) Heat ghee in a pan and add ingredients listed under seasoning. Fry for 20 secs. Make sure that you do not burn this. 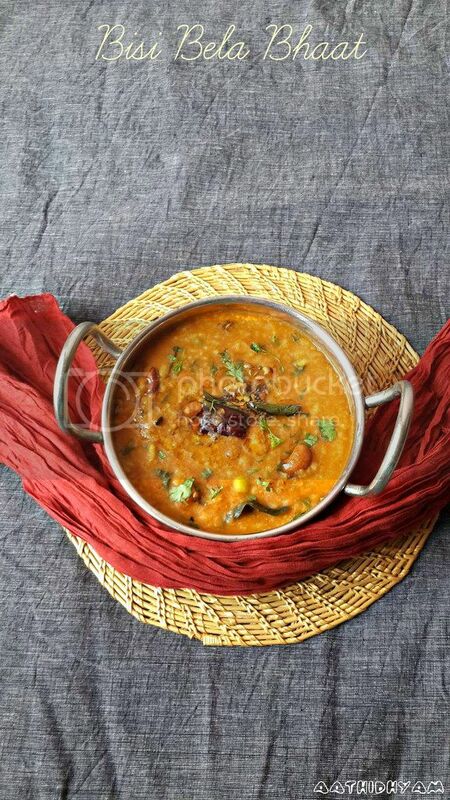 9) Add this mixture to dal. Combine all the ingredients well. 10) This should be of pouring consistency. 12) Serve hot immediately with fryums, papad and pickle as sides. My notes:1) You have to serve this recipe hot. As it cools, it becomes hard and may not so tasty. 2) This rice should be of pouring consistency. So add water adequetly. 3) You can use vegetables of your choice.